There is nothing quite so refreshing as a salad. But there is more to making a salad than simply throwing a few lettuce leaves into a bowl. The secret to a wonderful salad is the crispness and quality of the salad greens. This means buying the best and freshest, then knowing how to keep them fresh and crisp. Correct storage and preparation are therefore essential. The types of greens you use will probably depend on the time of year and whatever is available at the market. Provide contrast in texture and flavor by adding a variety of different leaves. To provide extra crunch add vegetables such as tomatoes, radishes, cucumbers, spring onions, peppers, celery, carrots or French beans. Nuts and dried fruit add interesting textures and flavors. Then garnish with fresh herbs. We show you how to prepare your salad greens, methods for preparing different greens, how to dress your salad and how to store your greens. Discard any wilted, discolored or damaged leaves. For spinach and similar greens, pull off the stalks. For leaves in compact or loose heads, pull them individually from the core or stalk. It is vital that all salad leaves are thoroughly rinsed with cold water to remove any grit or insects, as well as any residue from fertilizers and pesticides. Wash the leaves in the sink or large basin of cold water and swirl them round gently. Salad greens should be washed in 2 – 3 changes of water to remove all grit. Or you can wash them in a colander under trickling water. This will avoid bruising or damaging the leaves. The leaves must then be dried. It is important that the leaves are dried well otherwise the dressing won’t adhere to the wet leaves and the excess moisture will dilute the dressing. Lift the leaves out of the water, place in a soft dry tea towel and gently pat dry. Alternatively, put the washed leaves in a salad spinner. Salad spinners are excellent as they spin off all the water. Wrap the leaves loosely in a clean tea towel or paper towel and put in a large plastic bag or a salad crisper if you have one. Discard wilted or damaged leaves. Twist or cut out the central core. Rinse the leaves thoroughly in cold water and soak briefly to draw out any grit trapped in the folds. Drain and dry with a kitchen towel or spin dry. If the leaves are large, tear into pieces. Discard any wilted or damaged leaves. Pull off roots. 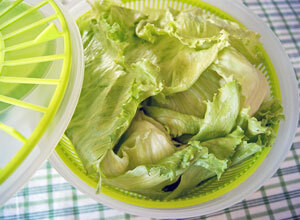 After rinsing dry on paper towels – it’s best not to use a salad spinner as this can bruise the leaves. Wash well in cold water and remove any tough or large stalks. Discard wilted, damaged or yellow leaves and remove thick stalks which will be too coarse for salads or soups. Rinse well and spin dry. 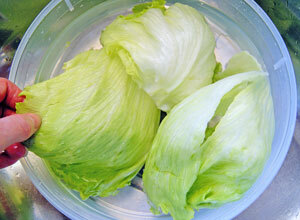 To assemble your salad tear the leaves into smaller pieces and place in a large salad bowl. Greens with small leaves should simply have their stems removed and left whole. Match the dressing to the greens. Pair strong flavored dressings with the more robust flavored greens. But remember the dressing is there to add flavor, not overpower the greens. For this reason I believe you can’t go wrong with a simple vinaigrette. A blend of oil, vinegar or lemon juice and herbs is a simple and effective way of dressing your greens. The ratio for a traditional vinaigrette consists of three parts oil to one part vinegar or lemon juice. While it's easy to buy ready-made, homemade dressings are so easy to make and far superior in taste. Pour the dressing over the leaves and toss gently until all the leaves are coated. You can use your hands for this or two large spoons. How much dressing do you need? You only want enough to coat the greens lightly, not drown them. Add a little at a time until you judge it to be enough. Garnish with parsley, coriander or basil if desired. Then serve immediately. Freshness, above all else, is the secret to a great salad. 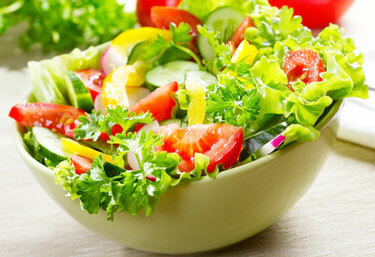 Provided your salad vegetables are bought fresh, the key to retaining that freshness is correct storage. Once you have purchased your greens, check for dampness. If damp in the center, pat dry before storing. Store salad greens unwashed. If you wash before storing, moisture will collect on the leaves and cause them to wilt or discolor. Store in the vegetable compartment of the refrigerator. As the level of vegetables in the compartment lowers, place a clean kitchen towel lightly over them to prevent moisture being drawn from them to fill the space. This is why the last few pieces in the vegetable compartment usually wilt. Salad vegetables can also be stored on the lower shelves of the fridge in a plastic bag, sealed plastic container or on a tray covered with plastic wrap. 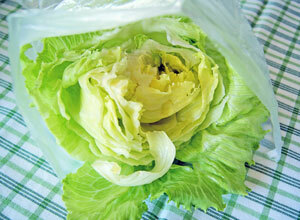 Most greens need to be used within 4 days, but lettuce such as iceberg or romaine will keep for up to 10 days.